The official explanation from the retail industry for the term “Black Friday” is that it’s the day when retail profits for the year go from red to black. Are you skeptical about this? You should be. After all, the term Black ___day has, in other contexts, always signified something terrible, like a stock market crash or the start of the Blitz. Is it reasonable to think that retailers deliberately chose this phrase to indicate something good? The dire warnings came from the sweet older women that took me under their wings in the arts and crafts department at John Wanamaker’s department store in center city Philadelphia shortly after I was hired as temporary holiday help in October, 1971. They warned me to be prepared for the hoards of obnoxious brats and their demanding parents that would alight from the banks of elevators onto the eighth floor toy department, all racing to ride see the latest toys on their way to visit Santa. The feeling of impending doom sticks with me to this day. The experienced old ladies that had worked there for years called it “Black Friday.” I’m quite sure it had nothing to do with store ledgers going from red to black. So all the evidence points in one direction. The term originated in Philadelphia in the 50s or earlier and wasn’t in common use in the rest of the country until decades later. 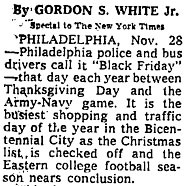 And it did indeed refer to something unpleasant: the gigantic Army-Navy-post-Thanksgiving day crowds and traffic jams, which both retail workers and police officers dreaded. The retail industry originally loathed the term, and the whole “red to black” fairy tale was tacked on sometime in the 80s by an overcaffeinated flack trying to put lipstick on a pig that had gotten a little too embarrassing for America’s shopkeepers. And now everyone believes it, which is a pretty good demonstration of the power of corporate PR. But now you know the real story behind Black Friday. UPDATE: Barrett/Kleger anecdote added via email from Ben Zimmer pointing me toward his piece on the subject at the Visual Thesaurus.